Why Make Danish Pastry at Home? There are many reasons to encourage you to make puff pastry at home. These reasons can include not having a bakery near you, you'll need fewer ingredients, and they'll cost less to make (not counting your time). The ingredients for about 12 Danish cost under $3.00 and the oven cost about 40 cents. Bakery Danish is more than $2.00 a piece, making it well worth your while to make these for your next party. If you haven't tried making them yourself then now is the perfect time to start. Anyone can make this recipe successfully by following a few simple tips. The dough for these Danish needs to rest for 6 hours or overnight, before you begin to work it. You will also want to prepare your desired filling beforehand, for best results. Dissolve yeast in warm water and a pinch of sugar. In another bowl, cut butter into flour until pea-sized butter lumps remain (see picture). In a third bowl, mix the rest of the sugar with the milk, egg, and salt. Add in the foaming yeast and water mixture and stir until combined. Pour liquids into flour and stir until just combined and flour is wet. Lumps of butter should remain. Cover the bowl and refrigerate for 8 hours to overnight. We've refrigerated for 6 hours and the pastry came out fine, so there is some leeway with this rule, but make sure the dough is very cold. After a six or more hour refrigeration, turn the dough out onto a medium floured work surface and pat into a square. Dust the top with flour and roll to a 16 by 16 inch square, dusting as you go. You will probably have to dust a little underneath the dough too, so it remains loose. The colder your kitchen is, the better, but I made this on a day where the temperature was in the 70s, so a wide range of temperatures is possible. You want the butter to stay hard, not smear and not incorporate with the flour too much. As this dough is cold, you will need considerable force to roll it to 16 inches. It can be a little work out. Here is where this pastry dough starts to look like traditional puff pastry, the folds. Fold the dough in thirds, like a letter. Use a spatula for any dough sticking to the table. Turn the dough ninety degrees, so that the folds are horizontal. Roll the dough out to a square again (that means you are rolling mostly in one dimension since the width is already 12 to 16 inches). Fold the dough into thirds again (from the left side and right side), just like a letter. Wrap in plastic and refrigerate at least 30 minutes. After the dough is thoroughly chilled, roll the dough out again into a 16-inch square. If you don't achieve 16 inches, it's okay. 13 to 14 inches is fine too. Fold again in thirds, roll out and fold and refrigerate (four rounds of folding so far). Refrigerate. Roll out the chilled dough to a 20 by 20-inch square. This takes a bit of time and effort because the dough is cold and stiff. Keep at it, it will be about 1/8 of an inch thick when you are done (less than 5 mm). Turn the dough if you need to, keeping it square. Flour the work surface as needed, but incorporate as little flour as possible. Cut the dough with a knife or bench knife into five-inch squares. If you have any trimmings, keep them and bake them to use as tasters (everyone wants to taste straight out of the oven). The last step before baking these easy, puff pastry turnovers is to brush with an egg white which has been whisked with a tablespoon of water. If you like, sprinkle coarse sugar, Hagelzucker or Perlzuker (shown here) over the pastry for decoration. 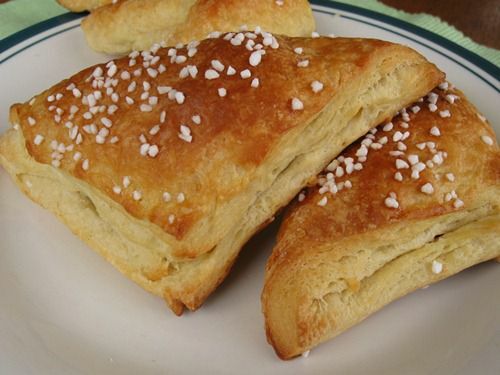 You can also wait until the Danish are out of the oven and drizzle them with a simple icing. You don't need to be limited to one shape for your easy Danish puff pastry. Here is a picture of a filled turnover, but you can make crescent shapes, pinwheels, two corner folds, and others. To make turnovers place two to three tablespoons of cherry pie filling in the middle of the square and seal the edges with water and finger pressure. Place finished turnovers on parchment paper and let rise about 30 minutes. Bake at 450 F (preheat, please) for 10 to 15 minutes, or until golden brown. They will be soft at first and become harder around the edges as they cool. Here are some Danish pastries (cherry turnovers, really) fresh from the oven. They taste best if you let them cool to lukewarm or at room temperature. If you make them the night before, cover them with a clean towel and they should be fine in the morning. If you like you can reheat for a few minutes in the oven or a few seconds in the microwave. Freeze them and serve them later, too. This is a great idea for a small household (save for Sunday treats) or for a complex party. They would make great bake sale items, too. This Cherry Turnover looks like it was bought at a bakery and tastes like it, too! Do not be afraid, you can master these lovely Danish.